Centuries-old cultural traditions still matter today. In 2003, Tom Cruise played Captain Nathan Algren in The Last Samurai. The Captain had fought in the American Civil War. He was hired by Japanese loyal to the Emperor Meiji to train an army of peasants; the plan was to fight the samurai who remained loyal to the shogun. Iyeyasu Tokugawa became the first shogun in 1600 and reduced the emperor to the status of a puppet. His descendants kept power until American forces under Commodore Matthew Perry "suggested" that the Japanese open up and permit trade. Being a firm believer in Willy Sutton's dictum "You get further with a kind word and a gun than with a kind word alone," the Commodore arranged artillery demonstrations for any interested Japanese. "Shogun" means "barbarian-subduing general." When the shogun couldn't subdue the barbarians, modernists urged that he had lost virtue and that power should be given back to the Emperor Meiji. Regardless of the underlying logic, it was obvious that many samurai would follow their oaths to the shogun and fight to the death for his cause. Kind words would not suffice, so the monarchists recruited mercenaries like the fictional Captain Algren from all over the world to train the emperor's peasant army how to use guns. The 30-foot Black Ship Scroll, which was painted around 1854, shows the origins of the situation from the Japanese point of view. The ill-trained peasants, still in awe of sword-wielding samurai, fled. The Captain was captured and came to respect the samurai way of life, particularly their sense of honor and devotion to duty. Such movies need a climatic battle scene, of course. Many samurai were killed and their noble leader gave his life for his cause, but the Captain lived on to help build the Japanese forces which defeated the Russian empire in 1907. This turning point in Japanese history is known as the "Meiji Restoration" because power reverted to the emperor and he led the nation into the modern world. The movie's title notwithstanding, the samurai didn't go extinct. Besides skill in wielding weapons, a samurai's most vital characteristics were loyalty and a sense of duty. 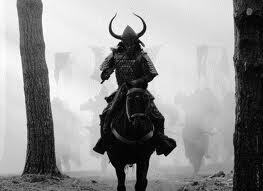 Samurai considered it an honor to give their lives in service to their master, clan, tribe, or family. The story 47 Ronin tells of a group of samurai who gave their lives to avenge the death of their master. During WW II, the kamikaze willingly gave their lives to destroy American ships which were endangering their homeland. Today, Japanese pipe fitters are putting their lives on the line to repair the reactors which threaten their fellow citizens. The Japanese attitude is totally unlike the Islamic suicide bombers. Islamics are motivated to give their lives to gain personal rewards in heaven. Japanese give their lives to leave better conditions for their fellow Japanese on earth after they're gone. Can anyone imagine any current American leaders doing the same? Barak Obama? Joe Biden? Hillary? John McCain was willing to a half-century ago, but times have moved on. The Japanese live on small, crowded, resource-poor islands. For centuries, they lived by muscle-powered agriculture where everybody works from "can't see to can't see" to pump water in the rice fields and keep the dikes in repair. If a dike leaks, a wall of water washes down the hill and wipes out the fields below. Anybody who can't maintain his part of the dike makes others starve. Japanese have looked out for each other - because they had to, or they'd all starve - as long as there has been a Japan, which is at least five times as long as America has existed. There is a free laundry service, too, although they are still working out clothes-drying kinks. Just two weeks after this nation’s greatest catastrophe in decades, the citizens at Takada Junior High School No. 1, this town’s largest evacuee center, have managed to fashion a microcosm of the spotlessly organized and efficient Japan they so recently knew. When New Orleans was damaged by waves of sea water, the residents sat on their hands, waited for the government to bail them out, and complained that it took too long for the government to give them nice-enough free housing. The Japanese, whose towns took far worse damage than New Orleans, organized self-rescue using whatever they could find. Society as a whole works better when everyone looks for opportunities to put something into the pot. All too many Americans are far more concerned with taking out than with putting in; is it any wonder that our economy is in trouble? "I'm scared," says Kenji Tada, 29 years old, a worker at protective-coating specialist Tokai Toso Co. "But someone has to go." There's no way to put it any better - "Someone has to go." Unless someone does the grunt work of fixing the cooling system, more radiation will leak and poison Japanese soil for miles around. Plant operator Tokyo Electric Power Co., or Tepco, and other companies that are sending employees to the Fukushima Daiichi plant say they aren't paying the workers extra or providing benefits beyond existing accident and sickness insurance. The companies say they have been too busy dealing with the emergency to consider such things. Workers haven't raised the issue either, they say, in a country where pushing for more cash in such a time of crisis is seen as crass. Imagine that - workers doing a nasty, dangerous job just because it has to be done. The high-school graduate ... was told he could refuse the call. But he says he felt duty-bound to accept, musing that he would be in the position of sacrificing himself for the good of others, as he says Japanese pilots did in World War II suicide missions. "If the call comes, there's only one thing I can say: 'Yes, I'll go.' I thought of the kamikaze - sacrificing yourself for someone else," he says. "My heart is calm." Japan will rise again; they're already on it. What's sad is that despite the challenges we face, many Americans seem to have lost all sense of duty. Unionized public-school teachers would rather make fake sick calls and demand more money from squeezed taxpayers than do the job they're supposedly paid to do and actually teach; couples would rather split up than stay together and raise their children; and we'd rather borrow from our grandchildren's grandchildren than cut back our lifestyles by the teeniest bit. We're recovering from an economic crisis; the Japanese are recovering from the most cataclysmic natural disaster in modern history. Which nation will come out best in the end? i'd like to see you write on *why* the japanese behave this way when other cultures (<cough> africans) do not. *why* are they more likely to band together, not loot, protect the common good, etc. i do not think that living on a small island is the sole reason. Terrance: I don't think race as anything to do with it. I do think class and culture do. The primary difference between Japan and New Orleans? No welfare state. That's not to say Japan doesn't have a welfare program, but they made a choice to not follow a western model. Paternalistic governments create what we see in Haiti, New Orleans, and elsewhere. Governments (and cultures like we used to have in the US) that emphasize self-reliance and "hidden assets, like neighborhood and family bonds" are more successful. Reuters says the Japanese trust their government not to blow their tax money. (Reuters) - Most Japanese want a new prime minister to lead rebuilding after last month's earthquake and tsunami, newspaper polls showed on Monday, as the head of government was again scolded in parliament for his handling of the nuclear crisis that followed. Japan is struggling to bring the Fukushima Daiichi nuclear plant under control after it was crippled by the March 11 natural disasters, a process that could take the rest of the year. Plant operator Tokyo Electric Power Co. (TEPCO) said on Sunday it hoped to achieve a cold shutdown to make the reactors stable within six to nine months. That timetable would only be met if "everything goes smoothly," Chief Cabinet Secretary Yukio Edano said. The full recovery could take even longer and rebuilding the shattered northeastern coast has yet to begin. The cost of material damage alone from the quake and tsunami has been estimated at $300 billion, making it the world's most expensive natural disaster. More than 13,000 people have been confirmed dead and tens of thousands made homeless. Nearly 70 percent of people surveyed by the Nikkei business daily said Prime Minister Naoto Kan should be replaced, and a similar number said the government's response to the nuclear crisis was not acceptable. Kan was criticized again in parliament on Monday for his response to the nuclear disaster. An opposition lawmaker suggested he had been ill-prepared from the start, pointing to Kan's admission that he could not recall the details of a drill last year that simulated a Fukushima-type incident. "Prime Minister Kan is working hard and he must be experiencing difficulties. But many people have questions about his leadership," opposition Liberal Democratic Party (LDP) lawmaker Masashi Waki told the upper house budget committee. Kan said he and his government were doing their best. "Japan has experienced many crises in the past, but I believe this is the biggest crisis in the 65 years since the end of World War Two," he told a parliamentary panel on Monday. "From now on ... we must persist with our strategy on two fronts, and I want to make every effort on both issues," he said, referring to rebuilding the country and resolving the nuclear crisis. Japan's Nuclear and Industrial Safety Agency said radiation levels in the reactors were making it difficult to work there, and experts say the crisis could drag on well beyond TEPCO's target. "Just soaking the fuel in water would mean it will take a very long time to cool down the fuel," said Hidehiko Nishiyama, a deputy director general of the agency. He said engineers were exploring other cooling methods. "For us to be able to dismantle the fuel rods and take them to another location will take time measured in years," he added. Besides battling to contain the nuclear crisis, the government must also figure out how to pay for the biggest reconstruction project since the aftermath of World War Two despite public debt already twice the size of the $5 trillion economy. The government hopes to avoid issuing new bonds to fund an initial emergency budget, expected to be worth about 4 trillion yen ($48 billion), due to be compiled this month. But bond issuance is likely for subsequent extra budgets and markets are worried that post-quake rebuilding may hamper Japan's efforts to rein in its debt. Ruling party executives are eyeing a tax rise but some lawmakers fear it would hurt the economy. "It is no doubt that a substantial amount of revenue sources will be needed for reconstruction," Japan's deputy finance minister, Fumihiko Igarashi, said. "I want to ask the people to share burdens broadly. While we review every spending and revenue to raise funds, everyone needs to share the pain."